13 March 2015, at 12:00a.m. Dietary fibre, and non-starch polysaccharides (NSPs) in particular, can have a substantial negative impact on monogastric digestion and performance, with restricted digestibility leading to significant reductions in feed efficiency and growth, says AB Vista. Yet despite more than three decades of research into the topic, there is still little consensus on how to achieve the greatest benefits when using NSP-degrading enzymes to regain that lost performance. This is predominantly due to a generally limited understanding of both the NSPs themselves, and how to subsequently optimise NSP enzyme use. The proliferation of products containing multiple NSP enzyme activities designed to tackle several NSPs at once, sometimes even combined with proteolytic, amylolytic or lipolytic activities, has only added to the confusion. To date, there is only limited evidence to directly link any of these additional activities to measured performance benefits, and in many comparative research trials carried out around the world, the product containing the most activities fails to produce the best results. Understanding the impact of NSPs, and how this relates to NSP enzyme performance, is therefore critical for end-users looking to make good buying decisions. Interestingly, although each plant-based raw material has a different NSP profile, and each NSP has subtly differing characteristics, the dominant NSPs and their impact on nutrient utilisation are remarkably consistent. Identifying the key NSPs that have a negative effect on animal performance is therefore critical when looking to optimise NSP enzyme use in monogastric diets. It is also important to remember that there are significant differences between how the insoluble and soluble fractions of each NSP behave within the gut. It is high concentrations of soluble long-chain NSPs (primarily β-glucans in barley- and oat based diets and xylans in wheat- and rye-based diets) that limit nutrient utilisation through increasing digesta viscosity, and the addition of appropriate β-glucanases or xylanases that will break up those long-chain molecules and recover performance. In contrast, the insoluble NSPs in the plant cell walls can act as a physical barrier that restricts access by the animal’s digestive enzymes. 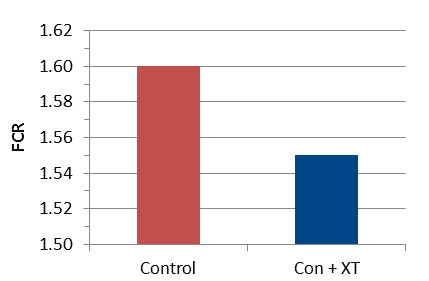 The addition of NSP enzymes able to disrupt this encapsulating effect can substantially improve access to starch – the main source of energy within cereal grains – and protein stored within the cell, and explains why use of a suitable xylanase can produce significant improvements in nutrient utilisation in corn-based diets, despite a low soluble xylan content. All of this has significant implications when it comes to tackling NSPs through inclusion of specific feed enzymes, with the use of an NSP enzyme that targets and degrades both soluble and insoluble fractions generally beneficial. 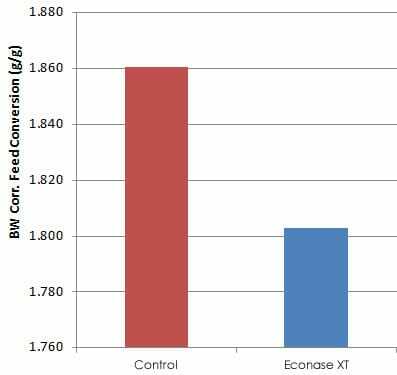 Econase XT xylanase, for example, was developed so that it is extremely effective in improving nutrient utilisation in both wheat-based diets (where insoluble and soluble xylans are an issue) and corn-based diets (where insoluble xylans dominate). What has become clear is that in targeting these key NSPs, it is enzyme characteristics and dose that are more important than the number of different activities present. The single enzyme xylanase Econase XT generally outperforms products containing multiple NSP enzymes, and supplying effective levels of additional NSP activities is not only difficult (due to differences in thermostability and activity at the pH found in the gut), but may actually be detrimental. For instance, the production of specific short-chain oligosaccharides (xylo-oligomers) as a result of xylanase breakdown of xylans is now known to promote the populations of beneficial bacteria in the hind gut, and may also subsequently reduce pathogenic bacterial populations. Not only do different xylanases produce different levels of the various xylo-oligomers (Figure 1) but products containing multiple NSP activities may actually degrade the beneficial xylo-oligomers. Such effects help to explain both the substantial improvements in animal performance seen when NSP enzyme dosing is correctly managed, and why it is so important to understand NSP and NSP enzyme interactions. The effects of combining multiple NSP enzymes are not additive, or necessarily worthwhile. However, the potential improvements available from the use of a well-targeted, high quality single activity NSP enzyme remain considerable. Even modest reductions in digesta viscosity through enzyme addition can result in significant improvements in nutrient digestibility, and subsequently feed conversion efficiency (Figure 2). a) Improvement in bodyweight corrected feed conversion in 0-45-day-old broilers (P<0.05). b) Feed efficiency gains in nursery pigs from 8-25kg liveweight (P=0.076). 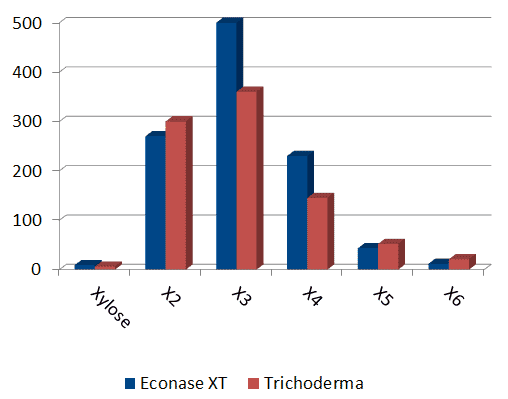 With a clearer understanding of how NSPs affect nutrient utilisation and how NSP-degrading enzymes can be used to overcome those limitations, it should also be no surprise that the most consistent and reliable results currently come from use of highly targeted, dose-optimised, single enzyme products such as Econase XT. Developed specifically to meet the needs of producers feeding wheat- and corn-based diets, the net benefit is better animal performance, a greater return on the investment made in feed enzymes and a consistency that has all too often been missing within the NSP feed enzyme sector.